've been a cyclist of one sort or another ever since that first red two-wheeler with the coaster brakes and plastic streamers sticking out of the handle-grips. But my "cyclist" self didn't start to fully form until I decided to try something more adventurous than simply riding down to the corner store and back. During my late high-school years I began to plan what was originally intended to be a post-graduation bike trip through Europe. That six-month tour in 1980 was the first of the several extended trips I've made by bicycle. The second (and longest) began in February of 1987, when I set out on the road again, using one of those one-year open airline tickets that lets you sketch out a skeletal route around the world. I didn't arrive back in Vancouver until the following February. The 1987 "round the world" journey was my last major bike trip for many years. 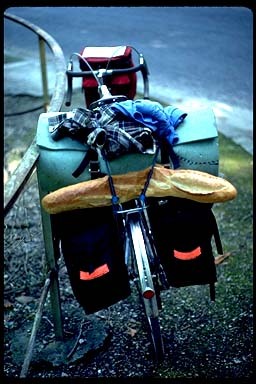 Until June of 2001, when I decided to burn up a few weeks of unused vacation time with another cycle trip in France. My route that year was along the Stevenson Trail — GR70 — through the Cevennes in central France. This is the route that Robert Louis Stevenson describes so wonderfully in his book Travels with a Donkey in the Cevennes. I used a mountain bike so that I could follow the walking trail as much as possible. It was a lovely ride, through a particularly beautiful part of France. 2004 marked my 50th birthday, and to celebrate I decided to bike along the Camino: the ancient pilgrim route through France and Spain, to the town of Santiago de Compostella. That ride was recorded using a web-log, which you're welcome to read. Text & images © Michael Hayward, 2004. All rights reserved.